The 56th Fighter Group was led by some of America’s greatest fighter leaders of World War II and was home to many of its leading fighter Aces: Under successive commanders Hub Zemke, Robert Landry, and David Schilling, the 56th destroyed more enemy aircraft in combat than any other fighter group in the 8th Air Force. Shown here are the 56th Fighter Group’s P-47 Thunderbolts as they climb through majestic cloud formations stretching as far as the eye can see. With ‘Bud’ Mahurin in the lead aircraft and ‘Bunny’ Comstock off his tail, they are already high above the east coast of England, in moments they will link up with the B-24’s to begin the perilous journey deep into Germany. 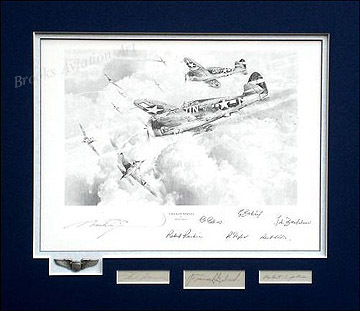 In the running dogfights high over Bremen, the “Wolfpack” claimed their most successful action of the war with 23 confirmed kills, 3 probables, and 9 damaged, creating an all-time record in the European Theatre. The 392nd’s B-24 Liberators could not have been in safer hands on that eventful day. Overall size: 26½" x 34¾"
The un-matted print is supplied with the Collectors edition. The matted print (shown here) was supplied with Wolfpack Tribute edition only, which is now sold out. print size: 16½" x 20½"